Norman Harris was the guiding force of Harris and Cole Bros., a company which made wooden pumps. The first factory was located on the mill race west of Main Street (the present Broom Factory Restaurant). The house was built in the Queen Anne style with a beautiful carved staircase, five different types of woodwork, a two-story porch on the front of the home and a Gothic watchtower. The third floor contained a large ballroom. When the house was built, it occupied the whole 600 block of West 12th Street. 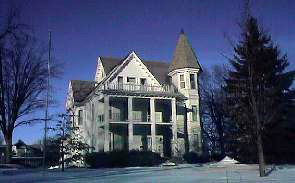 It is rather likely the two-story porch or portico on the front of the house is of later origin. This home was sold to Frank Cotton, the builder of the Cotton Theater (now the Oster Regent Theater). It was later converted into apartments and then to the Christie or the Lawn City Convalescent Home. Currently, it has been restored as a private residence.